Some sunxi devices, primarily tablets, only have a single USB OTG connector (mini or micro) as the only way to connect USB peripheral devices. Moreover, these tablets often don't have a dedicated 5V DC power connector and also rely on USB OTG for charging. This is less than perfect if the tablet is supposed to be sometimes used in a "linux desktop" or a "linux server" role, which requires being able to operate indefinitely without any need for periodic cumbersome maintenance, such as battery recharging. At the same time, supporting USB keyboard/mouse is necessary for handling interaction with the user. And if the tablet does not have an ethernet connector, then a USB ethernet dongle is very useful for providing network connectivity. So, ideally, we want to have the following feature: the USB OTG connector should be able to work as a USB host and also supply power to the tablet at the same time. There is a mechanical switch, which changes between "OTG" and "Charge" modes. 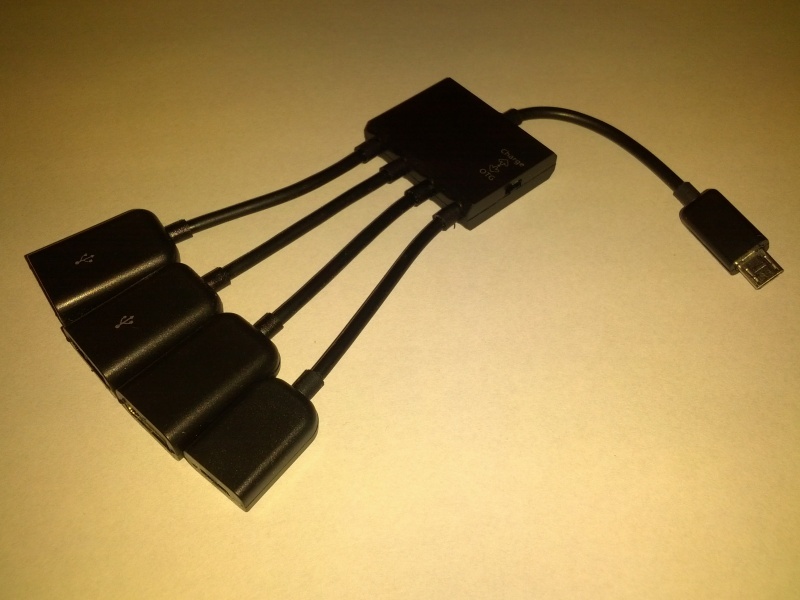 In the "OTG" mode, it acts as a powered USB hub, which allows to connect 3 USB devices to it. The power can be provided to it by a microusb charger cable by plugging it to a "female" microusb connector in the hub. The "male" microusb connector is connected to the OTG port of a sunxi device. If the switch is set to the "Charge" position, then the hub is also providing 5V on the VBUS pin to the sunxi device. and also provides host ports for connecting USB peripherals. the battery from it, regardless of the MUSB state. After this kernel tweak, if the mechanical switch is set to the "Charge" mode, then the hub can be used to provide power to boot the sunxi device perfectly fine and also drive 3 USB host ports. Tested on Olimex_A10-OLinuXino-Lime, Olimex_A13-OLinuXino-Micro and Cubietech_Cubietruck with the use of "female microusb <-> male miniusb" adapter. 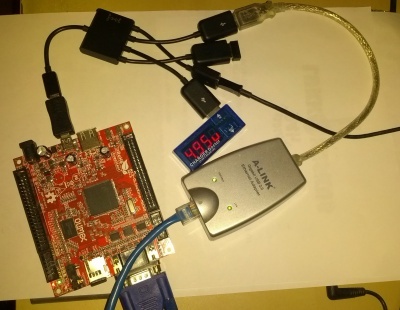 The picture above is showcasing the use of this hub to provide power to Olimex_A13-OLinuXino-Micro board and also connect a USB Ethernet dongle and a USB wireless keyboard/mouse receiver. In this setup, X11 linux desktop system works properly with all the interaction with the outside world done using just USB OTG connector alone. This page was last modified on 9 December 2016, at 18:36.